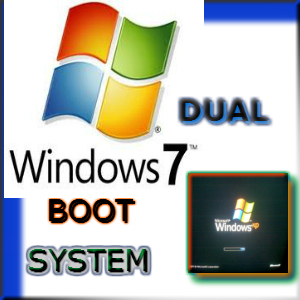 Dual boot system is installation of two operating system of computer installed in different partitions.The lower versions will installed in drive c: and the higher version will installed in drive d:.Why we installed two operating system of computer?there many circumstances,such as, you need the lower operating system so that the program you need will run or compatible only with winxp version.Another is you need the higher version of win 7 so that you can run the program in which compatible also with the win 7 versions.Another circumstances, when the other operating will break down because of a virus and user error you have reserved operating that you can use. But installing this two operating system,we will also considered the advantages and disadvantages of both sides.Example,consider that you successfully installed the dual boot system,and you select the win xp during boot strap.Then you open the file came from the win 7 compatible program.But you cannot open it and saw that file when you open the storage folder.The big reason is, that file is higher than the lower versions of operating system you used.But the advantages is, when you select the win 7 as your operating system you can easily and manage the program came from the operating system win xp.Because the win 7 application is higher version compare to the win xp. Now,how to install this two operating system,just follow this steps.You need also to consider your computer is high speed.That can carried the two operating system files.I will consider also that you have experience in installing the two operating system’s versions. Suppose that you have now the two operating system mention above and your cpu have a cd/dvd drive installed.Install first the winxp in partition 1 and install the win 7 in partition 2 after you successfully installed the win xp. Now,change the boot sequence or drive priority.Besure that the cd/dvd rom is the first boot.Check also the main bios menu,if your HDD is present during boot sequence. Once the POST initialized the settings,Press spacebar or any key to boot strap the start up file of win xp operating system. Then you will prompted in 3 options,just press enter key.Just follow the instruction of the screen and if you as to accept the agreement just press “F8” to accept. Now you are going to delete the old partition of your HDD.Be sure that you backup your important file before to do so.All the content of your HDD will vanished after you delete the partition. Consider that your hard drive is high capacity even 500 GB or 1 Tb to assure that your installation with the other programs is suitable for space.Both the programs of winxp compatible and win 7. Now delete the partition,just follow the instruction of the screen how to delete.Just press D as delete partition and press L to continue if ask. Just proceed to delete the second partition.Just repeat the procedure how you delete the 1st partition. Now,once all the partition is deleted,create the new partition.Create three partition as necessary for winxp, win7, and the drive for your data.Just follow the onscreen instruction.Just press “C” as create and define your bytes capacity for first partition.And proceed for second partition and define the bytes capacity.Now on the third partition as remaining,just press enter key to finish partition. Once your partition is complete,proceed for the formatting of your first partition for the winxp windows files.Just select the NTFS as your filling system and press enter key to proceed for formatting. Now,wait for 100% progressive indicator,and it will proceed to copy the windows file after formatting. Once the copying of files finished,your computer will restart and it will start setup of windows xp files. Just follow the onscreen instruction.If you ask to install the product key.Just type it in the text bar provided in the windows setup and proceed. After the windows setup is successful and you will prompted in desktop.Just restart your computer and put your CD/DVD win7 installer to boot strap the startup files during POST. Now the installation will initialized the system,once prompted in options just select to install the windows. Just follow the onscreen instruction on it. Once prompted in selection of partition,select drive D: or partition 2 where you installed the windows seven. Just select format to ready the drive to receive the windows 7 files. After formatting it will continue for setup the windows and initialized all the systems functions. Just follow onscreen instruction when ask. Once the windows installation ask for product key just type it in the installation bar. Once prompted in the windows desktop,your successful for your dual boot system installation. Proceed for the installation of all drivers of your hardware and software you need in your computer. In dual boot system be sure that your computer processor and its compatibility is capable to run the two operating system. Your computer it must be dual core compatible or higher. Be sure that your HDD has a high capacity, it must be 120 GB or higher. You must to backup important files before to proceed. It must be three partitions if your in the create partition during installation.